Our sixth day in Japan started early, so we ate breakfast on the train… grilled mochi filled with adzuki beans that we had purchased the night before. Yum. So where were we off to so early? We didn’t stay long though. We had just a few moments to step outside the Nagano train station and look outside, before we were back on a train again. This time a much, much smaller express local train. Which had an awesome view out the back. Past small village streets, where the clanging of the train crossing bell could be heard before we got to every road. … to grandmother’s house we go? No, wait, that’s not right… both my grandmothers live in the US. And I’m pretty sure (though not 100% certain) that the Japanese side of my family isn’t from Nagano. Here we are! But where is here? Look! A ninja! I knew we’d see one in Japan! Did I mention it’s really freaking cold where we were going? REALLY. FREAKING. COLD! Yeah, so… we’re still not there. We’re on a bus! We’re off the bus, anyways… and it’s snowing harder. Now we walk. Uphill. In the gentle snowfall. The snow might not seem all that significant, especially to those of you who live in or frequent snowy areas… but Son had never, ever been in snow before. Here’s where we were headed! At least, this is the entrance. Can you tell where we were going yet? The higher up the mountain we got, the more the snow stuck. Only halfway there… but a nice little refuge if it’s snowing or raining too hard! We’re here! For real! Finally! I’m sure you’re wondering by now… where exactly is “here”? 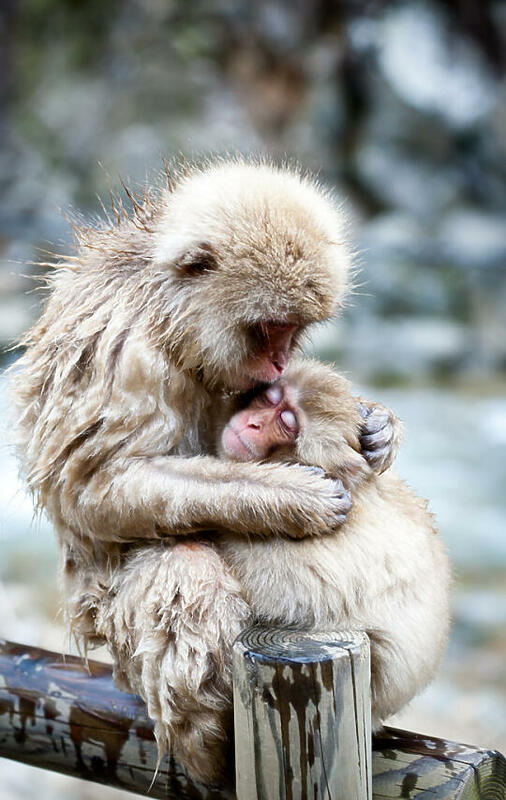 This is the Jigokudani Snow Monkey Park in Nagano, Japan. 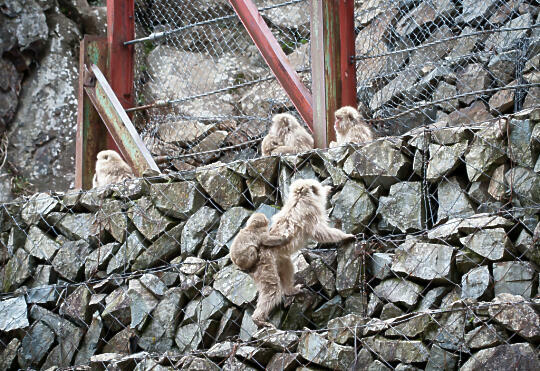 A large family of snow monkeys comes down from the surrounding mountains to hang out here during the day, and then go back up to their home in the mountains at night. Although us visitors are not allowed to feed the monkeys, workers here will give the monkeys a few apples as treats every day. 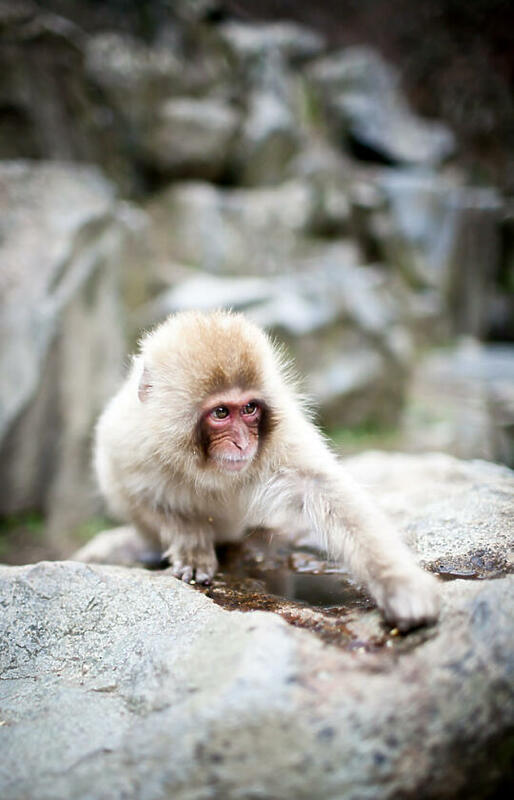 They don’t mean to provide the monkeys with their full diet, but instead give them incentive to keep coming down to the snow monkey park in the valley every day. 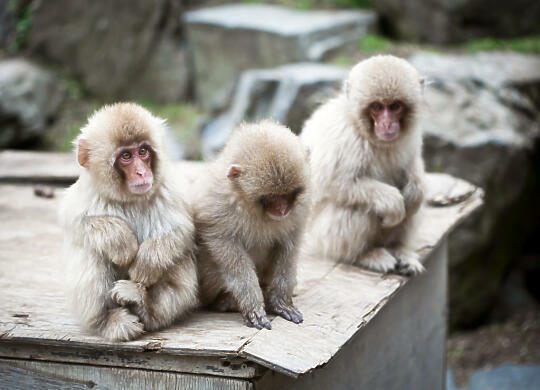 You could spend hours watching the monkeys play and eat and all that monkeys do. We probably would have stayed out there longer, if we hadn’t needed to catch the bus back to the train station. If we did this again, we probably would make it a two-day trip, and stay at one of the little hotels on the mountain, so we could spend more time with the monkeys. And definitely would go in either winter or summer, when the colors are more vibrant and everything’s not just brown. 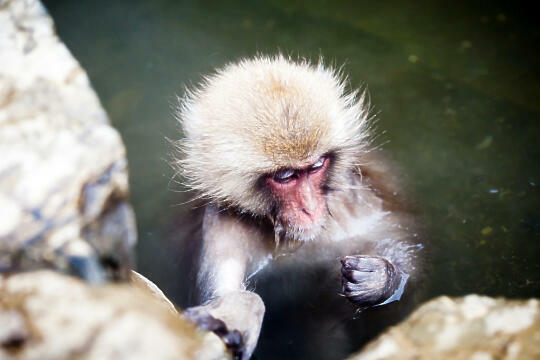 After a while of watching them, you started to learn each monkey’s distinct personality. The above picture is one I took on Son’s iPhone, of him taking the below picture. See how close they could get? 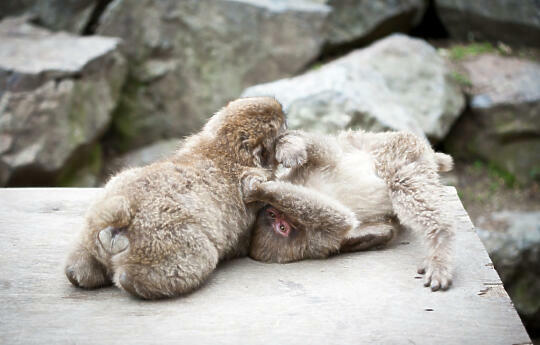 One even ran up and grabbed onto Son’s leg as it was playing with another monkey! We were up there for two hours (not including the half-hour walk up to the monkey park) before I got too cold… I went and hung out in the little hut that doubles as a souvenir shop, that has a tiny heater so I could thaw out my fingers and legs. While I warmed up, Son went back out again, for another hour! … can you blame him? Looks like we were just in time to share the train with masses of uniformed local school children, who all took the train home after they were finished with their school day. 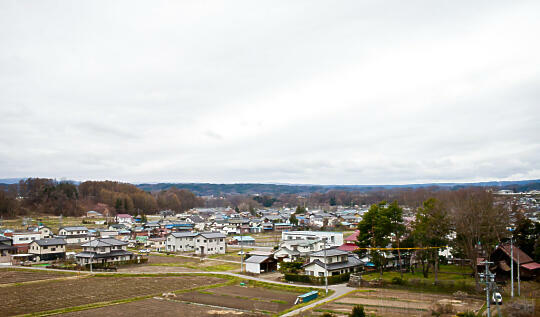 By the time we got back to Nagano, we were starving. So of course, we went in search of good food. Every department store in Japan has a big food area in the basement. They’re worth checking out! We stopped by a food stall that had steamed pork belly buns… ohmygod SO good. … and a banana-chocolate ice cream-filled waffle. After taking an elevator up to the top floor to see if there was any other good food up there (there were restaurants, but nothing that really appealed to us.) we decided to walk to the Zenkouji Temple. On our way there, we passed a Mos Burger. We had been wanting to try this Japanese burger chain, so we stopped in and shared a burger. Very good… much lighter and tastier than most burgers you can find here in the US! Until we found a little shop with free wifi… and discovered that the Temple had already closed a couple of hours ago. Oops. Good thing we checked! Back to the train station we went, to go reserve our ticket (free with the JR pass) to take the Shinkensen back to Tokyo. We had some time before the train left, so we went off to find some more food. Because Son really wanted to try some soba while we were in Nagano (it’s the specialty there). … and we had just enough time after our meal to stop and watch this man paint huge pictures with water, before we had to dart to the platform to catch our train. What a long day! Such a tiring day, in fact, that Son and I fell asleep on the way back to Tokyo, my head on his shoulder, his head resting on mine. 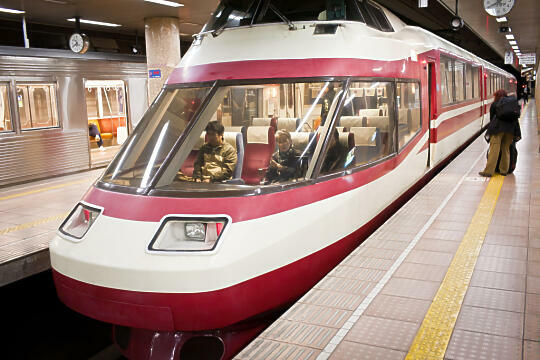 It’s a good thing Tokyo was the last stop… the conductors had to come wake us up after all the other passengers had left! Don’t forget, just a couple of Japan posts left! Leave a comment on any of my posts about Japan, and you’ll be entered to win one of two bamboo rolling mats and packages of nori from the Tsukiji Fish Market. One comment per post, please! 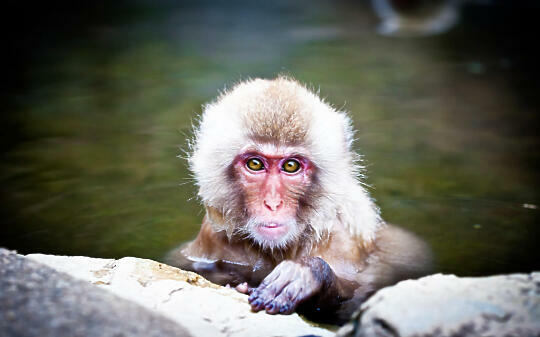 The snow monkeys are so so cute. I have to see them in real life. Thank you so much for taking us along with you to Nagano! Great pictures. Oh, my gosh! 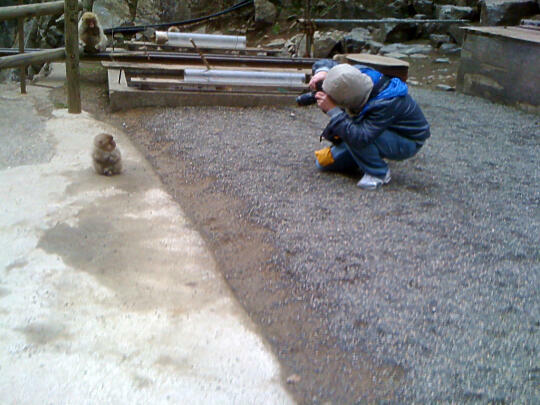 Those baby monkeys are so cute, and it’s crazy how close you got to them. I should have written scene. English is so funny. The Japanese calendars always had a Japanese forest scene seen in December. So cool! 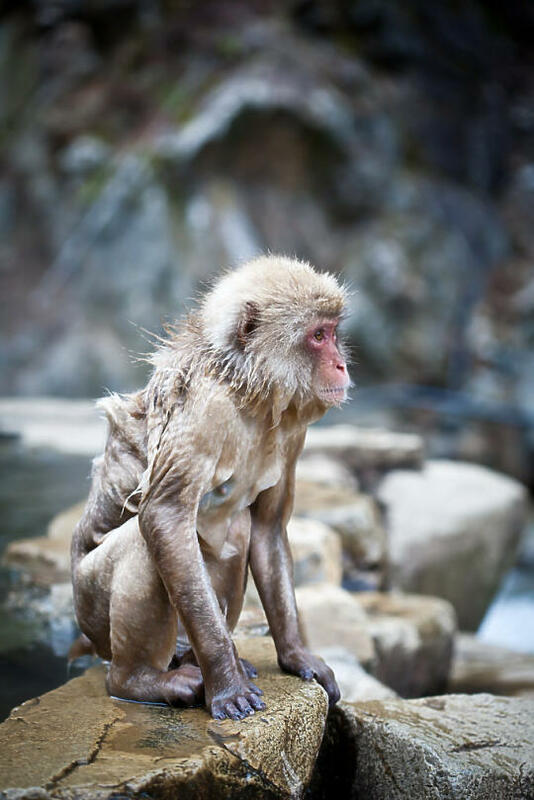 I’ve always really wanted to visit Japan but the pictures of the snow monkeys sealed the deal! It’s gotta happen soon!! wow amazing pictures of the monkeys! about the bus trip to the monkey area, around how long did it take & was it on a steep slope? These are some seriously good pictures. Congrats. Will be there in Nov 2010 and cannot wait. Hi, first time that I found your blog. The pictures are amazing!! 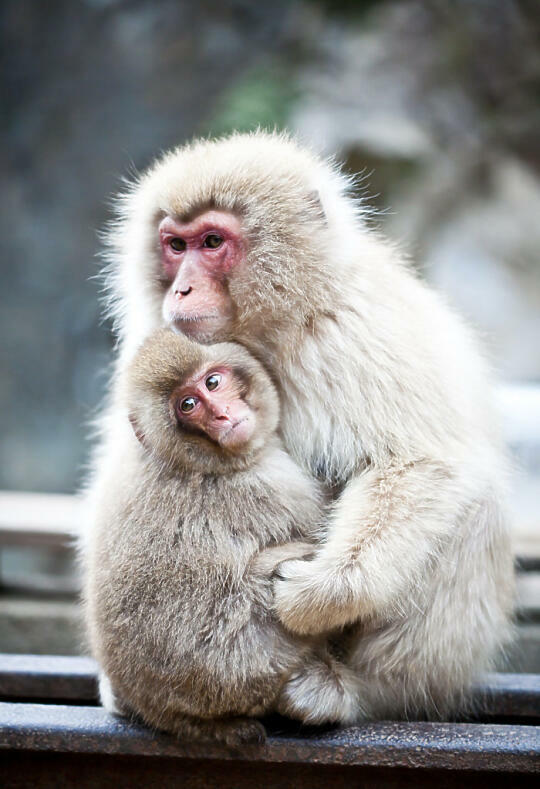 And the monkeys are so adorable. I wish I can come here during my trip, but I don’t know if I could handle the cold in October! Also, do you mind what lens Son uses? Wow your photos are amazing and I really want to see these monkeys for myself, just trying to work this out you were there in July (summer) and was very cold with snow? I am trying to decide if we will be able to do this in February as a day trip from Tokyo or whether we won’t be able to because of too much snow (we are from tropical location so will be struggling to keep warm anyway). Please tell me you have a recipe for the adzuki bean paste filled thing! Looks yummy!! I loveee watching all the great pictures of your blog especially on your trip to Japan. Im going to Japan next year and I made your blog as reference. I really like the idea of photo journalism. I am going to Kyoto, Osaka, Nara, Nagano and Tokyo all in 9 days. Is it feasible? 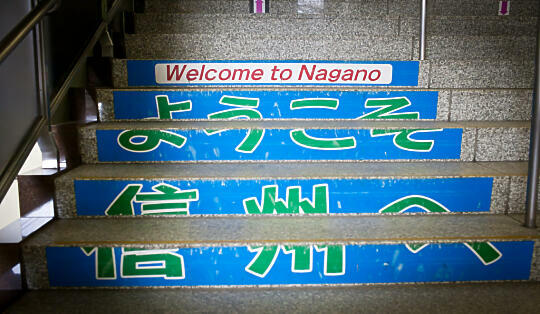 Is 1 day for Nagano sufficient enough?